New Delhi: The Delhi Metro Rail Corporation (DMRC), which has made a significant contribution in facilitating people to travel in Delhi, has made a new record. Actually, Delhi Metro has installed India’s longest escalator ever. This escalator is installed at the Janakpuri West Metro station of Magenta Line. So far, the Escalator located at Terminal 2 of Mumbai Airport is the longest in India, with a length of 11.6 meters. At the same time the length of the Escalator at Janakpri West Metro station is 15.6 meters. According to the Delhi Metro Rail Corporation spokesperson, its height is as much as a 5-story building. With the opening of new section between Kalkaji Mandir Metro and Janakpuri West, this escalator will start functioning. The spokesman said that this work was not so easy. A special crane was procured for it to be made, which weighed 250 tons. Explain that this escalator is 17 meters below the ground level. Until then, the escalator at Kashmiri Gate was the longest. DMRC estimates that around 53,700 additional passenger will use interchange points. At present, this station uses about 15,000 passengers. 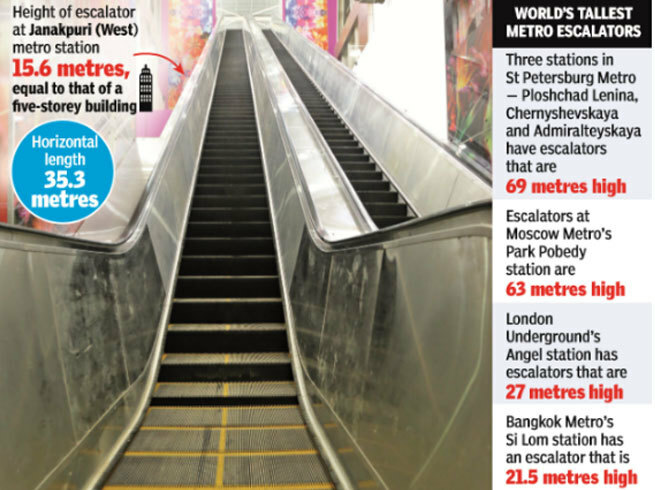 The world’s longest escalator (69 meters) is located in Russia’s St. Petersburg metro. The second number comes from Moscow (63 meters). Explain that the safety of the 25.6 km new Metro section between Janakpuri West and Kalkaji temple has been done. It got green signal last week. There are 16 new Metro stations in this section, two stations, Hauz Khas and Janakpuri West will provide interchange facility to the passengers. With the opening of this section, many areas of Vasant Vihar, Munirka, IIT, Greater Kailash, Chirag Delhi and South Delhi will be on the map of Delhi Metro. Also, the distance between the capital’s Noida and West Delhi will decrease. Apart from this, Terminal-I of Indira Gandhi International Airport will also get the Metro link for the first time.